Jealous of that big gaming rig? Akitio's Node lets your laptop use even a GTX 1080 Ti. 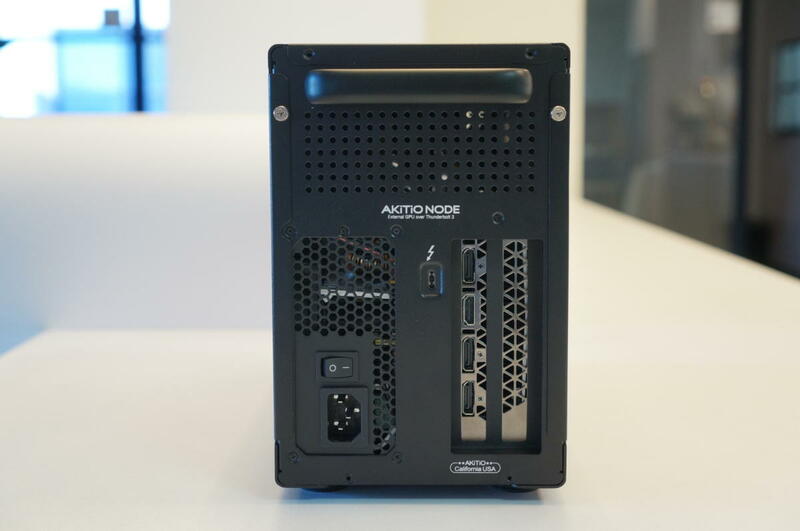 The Akitio Node external GPU cabinet is here to give your Thunderbolt 3-equipped laptop a big boost. 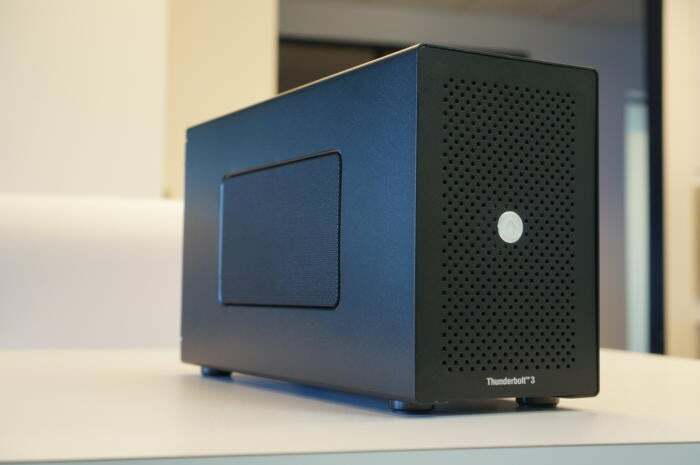 This affordable unit—basically, a big steel box with a 400-watt PSU and a fan in front—lets you drop in most modern AMD or Nvidia graphics cards and then connect it to a laptop using PCIe over Thunderbolt 3/USB-C, eliminating the need to futz around with DIY external GPU setups. For the most part, when it works, it’s amazingly smooth. For example, we cracked open the Node, dropped in a Founders Edition GeForce GTX 1080 Ti card, then plugged it into a HP Spectre x360 13t. Once we had the latest drivers installed from Nvidia’s website, we were off and running. As these results from 3DMark FireStrike Ultra show, the tiny HP Ultrabook gives what-for to big, giant, fast gaming laptops. Yes, a sub-3lbs. laptop can hang with big fat gaming laptops—if you cheat like we did. 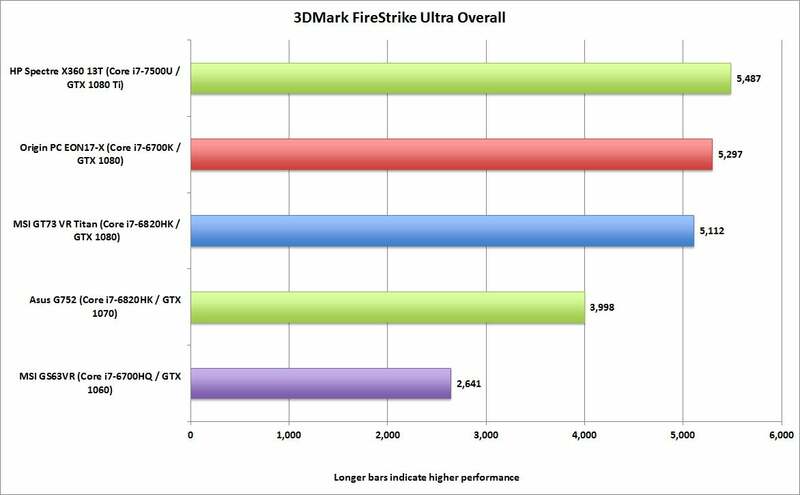 The score you see above, however, is the overall score for 3DMark FireStrike Ultra, which also counts CPU performance. The dual-core Kaby Lake chip in the tiny HP Spectre x360 13T isn’t going to compete with the quad-cores. In the 3DMark test that includes just the graphics performance, however, you’ll see a better spread from the GTX 1080 in the giant EON17-X laptop. Yes, there’s a good chance the limited x4 PCIe Gen 3 could rob you of some performance over what you might get if the GPU were in a desktop. In fact, the same GPU will typically score in the 7,000 range when in a full x16 PCIe Gen 3 slot. But just remember: The alternative is being stuck with the integrated graphics in the laptop, unable to game at this higher level of performance. 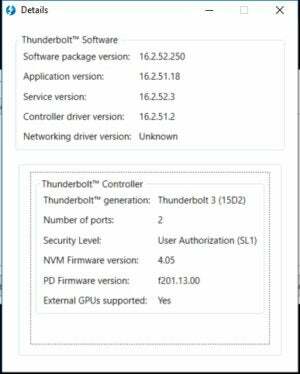 It’s pretty much a no-brainer: If the Node works with your Thunderbolt 3-equipped laptop, go for it. But that ‘if’ is a really big question. Although we think Thunderbolt 3 is wonderful, support for external graphics is still pretty spotty. 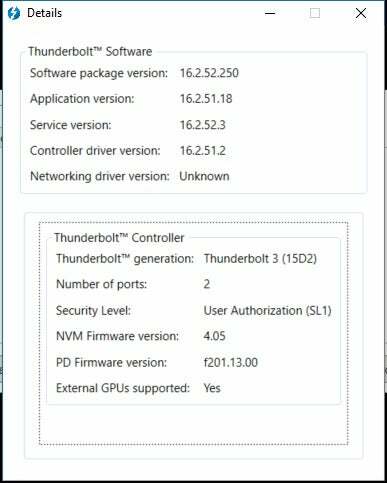 The problem, we’re told by vendors: Boot support for external graphics over Thunderbolt 3 isn’t quite standardized yet. That means the list of laptops with official support is pretty minimal. As of this writing, it’s Intel’s NUC, the HP Spectre x360 13T, and Razer’s Blade and Blade Stealth. Many who have purchased it using laptops not listed by Akitio have reported success too, though. Might is the operative word. We bombed out on laptops that said they supported external GPUs. We bombed out with the Skylake and Kaby Lake versions of the Dell XPS 13. We also had issues trying to get it to work with laptops with internal discrete graphics. Akito has since added a firmware update that lets it bypass laptops that don’t support it, but we haven’t tested it yet. Support on the Apple side of the aisle has also been bad. We tried it on a MacBook Pro 13 (2016) a few months ago. The limitation is the OS: Sierra doesn’t work with external graphics without much hardware and software hacking, but High Sierra does apparently implement it if you use a Radeon RX 480 GPU. 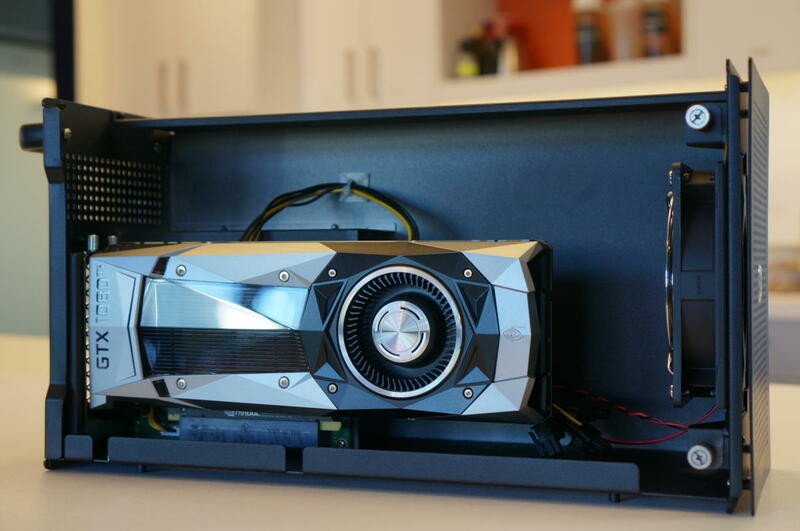 Even though Nvidia has drivers for its GeForce cards on OSX, it apparently doesn’t work, Akitio says. Akitio’s list of compatible GPUs runs the gamut of most modern cards. The company says MSI’s big, burly 1080 Ti cards won’t work as they apparently trigger the overload protection of the Node. We had no issues with our GeForce GTX 1080 Ti Founders Edition, however. 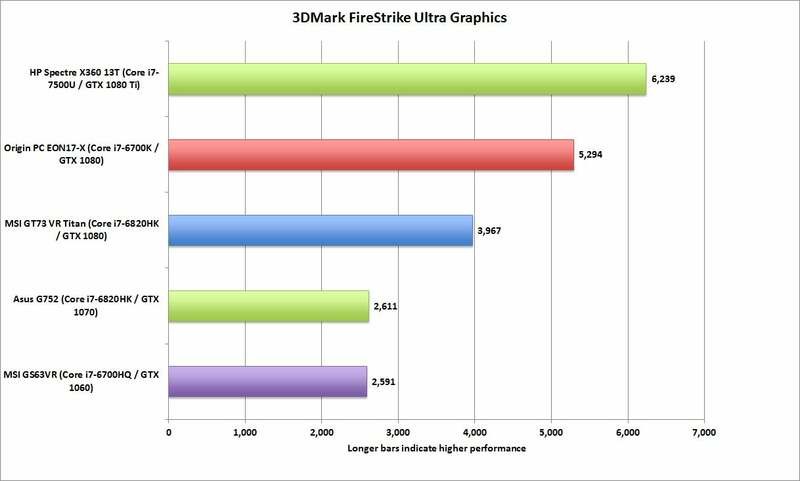 To test it, we ran 3DMark’s stress test through about 150 iterations with no issues. Here’s what makes the Akitio Node tick. Our biggest complaint with the Node is its size. Much like the Alienware Amplifier it’s simply gigantic at 15.5 inches long, 5.5 inches wide and 8.5 inches tall. GPUs just aren’t that big. It legitimately feels like it could be 20 percent smaller. The situation isn’t helped by the cable Akitio provides. While we appreciate that you get one at all, the 20-inch cable means it’ll be sitting on your desktop alongside the laptop. Akitio officials said the reason for the shorter cable is cost. To hit Thunderbolt 3’s 40Gbps data rates while using a passive cable, you need to keep the cable to 20 inches or less. Beyond that, you need an active cable, which ups the cost and complicates everything. A six-foot Thunderbolt cable would cost $52. The Akitio Node doesn’t have the frills of the competition but it’s got the one that counts the most: eGPU support. 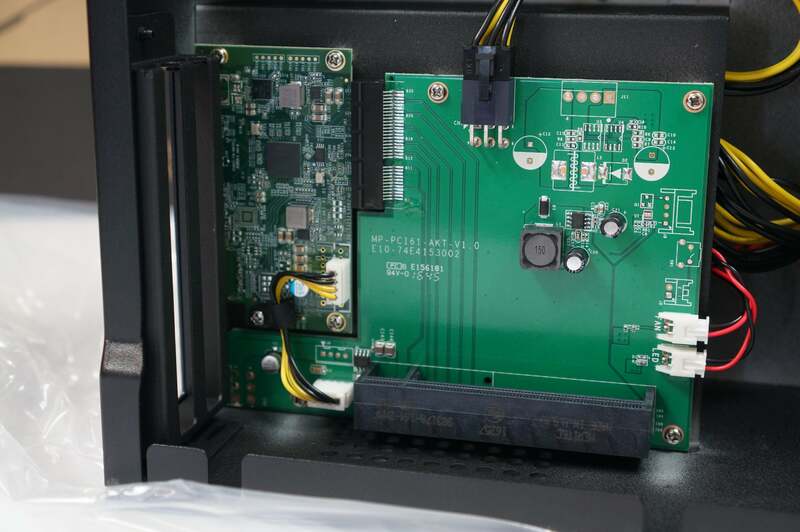 If we were to pick another negative, it might be the lack of additional ports such as ethernet or USB, such as the competition has. Akitio doesn’t charge what the competition charges, either. Razer’s Core was the first Thunderbolt 3 eGPU box but at $500, it’s hard to justify despite the beautiful construction. PowerColor’s Devil Box, which we haven’t reviewed, is also quite expensive at $450 Remember, you still have to add your own GPU. The lowest priced competitor is Alienware’s Amplifier, which was the first mainstream external graphics box that worked. These days it’s exceptionally priced at $170, but it only works on Alienware laptops using a proprietary connector. At $300 on the street, the Akitio is bare-bones, but it’s low enough in cost that you can still afford your GPU. In the end, the Akitio Node is reasonable and moderately priced way to get real graphics performance in a Thunderbolt 3-equipped laptop. The only real caveat—and this isn’t only on the Node—is that external graphics over Thunderbolt 3 is still a work in progress.